Have you ever wanted a notebook that can last you up to 12 hours of web browsing? Then you might want to have the ASUS EeeBook X205TA. The ASUS EeeBook X205TA is a very affordable 11.6-inch Windows 8.1 notebook that weighs less than 1kg just as light as feather, so it’s lighter than other 11-inch notebooks on the market and has a compact, space-saving and attractive design, while also delivering awesome sound quality. Trusted Store, Cash on Delivery, Genuine Products+Free Delivery BUY WHITE ACER EeeBook NOW! Trusted Store, Cash on Delivery, Genuine Products+Free Delivery BUY DARK BLUE ACER EeeBook NOW! Trusted Store, Cash on Delivery, Genuine Products+Free Delivery BUY RED ACER EeeBook NOW! A value notebook doesn’t have to mean settling for something basic. ASUS EeeBook X205 gives you all the notebook essentials with a premium feel. It features compact dimensions, streamlined curves, and tactile finish. The ultra-slim profile of the ASUS EeeBook X205 makes it portable enough to bring everywhere with you. It even fits snugly in your shoulder bag. You will find it not difficult carrying the laptop around. The ultra-thin notebook measures only 17.5mm – no thicker than the width of your finger. EeeBook X205 features a narrow 1.45cm bezel design to give you a comfortable 11.6-inch display viewing experience in a notebook that is considerably smaller than others in the market. Even the adapter has been designed to keep you on-the-go. Measuring just 53 x 53mm, the adapter of the ASUS EeeBook X205 is no bigger than your credit card and is small enough to put in your pocket. It even has a rectangular DC power connector jack that fits right-side up, or upside down. The body of the ASUS EeeBook X205 is made of matte plastic and is well-built for its price. It is available in four expressive colors. The notebook packs a chiclet-styled keyboard. The full size Chiclet-styled keyboard features an improved design that allows for more accurate typing. It has 1.6mm of key travel with little key float for a solid feel and more comfortable typing experience, and is durable enough to last 10 million keystrokes. Users of larger notebooks will likely need time getting used to the keyboard, though. Coming to the display, the ASUS EeeBook X205TA measures 11.6-Inch 16:9 HD Glare panel Display with a resolution of 1366 x 768 pixels, which is the minimum we expect a modern laptops to have. Graphics is driven by integrated Intel HD graphics. ASUS EeeBook X205 is powered by an Intel® Bay Trail-T Quad Core Z3735 1.33 GHz Processor that has the power to handle all your daily computing needs. This present chip, which is paired with 2GB of DDR3L RAM, is more power efficient – making a fanless design feasible. The fanless design of the ASUS EeeBook X205 keeps noise levels down, ideal when you want to work silently libraries or coffee shops. ASUS EeeBook X205 is designed to give you a more intuitive touchpad experience. It utilizes an exclusive technology used in the production of smartphone touch screens to give you a highly sensitive touchpad with incredible accuracy. It has a multi-touch touchpad that’s 36% larger than those found on similar 11.6-inch notebooks on the market and allows you to intuitively scroll through webpages. Using the larger touchpad feels entirely natural, thanks to multi-touch and Smart Gesture input. ASUS EeeBook X205 lets you swipe and scroll through webpages or pinch-zoom in and out of images so you can make the most out of Windows 8.1. ASUS EeeBook X205 gives you up to 12 hours* of battery life so you needn’t worry about running out of batteries while on long flights, or when working out of libraries or coffee shops. The Onboard eMMC flash storage is only 32 GB, which users will certainly have to complement with external storage and free WebStorage from ASUS plus Unlimited Microsoft Onedrive storage. With ASUS WebStorage, your personal stuff is always with you on any internet-connected device. Your files are synchronized between all your devices, so you always have instant access to the latest versions. WebStorage offers you easy storage, sharing, and syncing of everything from business presentations to personal photo albums and your favorite music or movie files. Tuned by the ASUS Golden Ear team with the goal of providing you with the best PC notebook audio, SonicMaster gives ASUS EeeBook X205 crystal-clear sound delivery. Whether you’re on headphones or speakers, you’ll experience richer, more detailed audio. 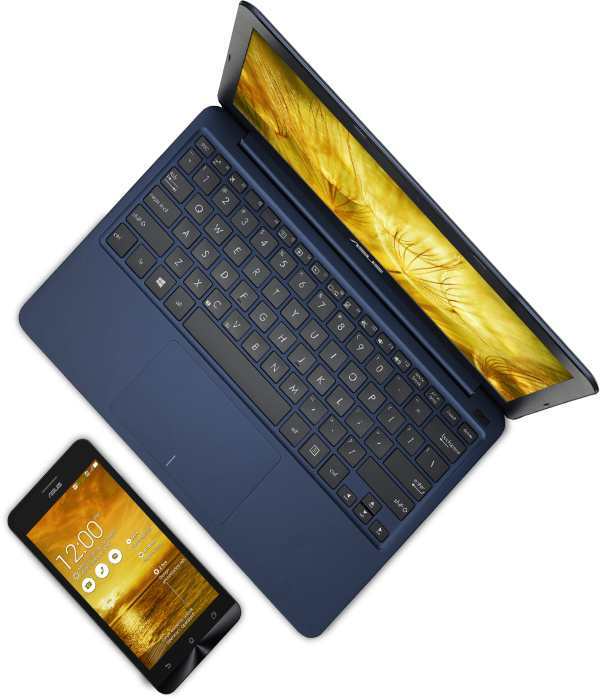 ASUS EeeBook X205 features two front-facing speakers situated under the palm rest. These high quality speakers direct sound towards you – fully immersing you as your favorite movies and music come to life. Available ports and interfaces include two USB ports, a micro-HDMI video output port and a microSD card reader. ASUS EeeBook X205TA comes with webcam, Bluetooth and Wi-Fi. The ASUS EeeBook X205TA runs on the latest available Windows 8.1 operating system. Windows 8.1 does things better, in fact a whole lot better than other operating systems on the market today. Windows 8.1 on the ASUS EeeBook X205 is fully compatible with various software and hardware. ASUS EeeBook X205 runs Microsoft Office smoothly online and offline and is compatible with a wide range of USB devices. It comes with a 1-year subscription to full versions of Word, Excel, Outlook, PowerPoint, Access, Publisher and OneNote, along with 1TB online cloud space, ASUS EeeBook X205 is ready to help you with work or school from the moment you switch it on! Another amazing feature of the ASUS EeeBook X205 is its connected Standby technology which gives you a smartphone-like user experience on a notebook – allowing apps to refresh even when the notebook lid is closed so you don’t miss app updates and messages. There’s also ultra-fast resume from sleep mode too, so ASUS EeeBook X205 is always at the ready. Asus EeeBook X205TA notebooks are available in Nigeria. You can now buy the entry level laptop at leading online stores in Nigeria. Asus EeeBook X205TA price in Nigeria starts at around N46,600, depending on your location and the configuration of the laptop.